What prettier bit of scenery on the coast of Maine than Little River, with its small town at the head of harbor, and its tree-fringed rocks bordering its shores? -- Mary Bradford Crowninshield, All Among the Lighthouses, 1886. Cutler, on Maine's rugged "Bold Coast," is a town of under 800 residents with a still active fishing fleet and a picturesque and unspoiled waterfront. The harbor is the last protected harbor on the Maine coast before Canada. 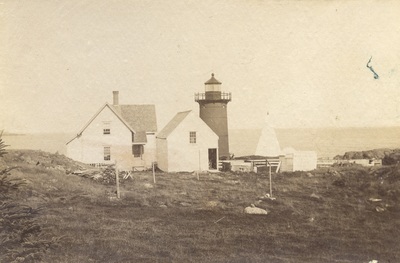 As trade, shipbuilding, and the fishing industry grew in Cutler, Little River Light was established in 1847 on Little River Island at the harbor's entrance. A stone keeper's house was also built, attached to the stone lighthouse tower. 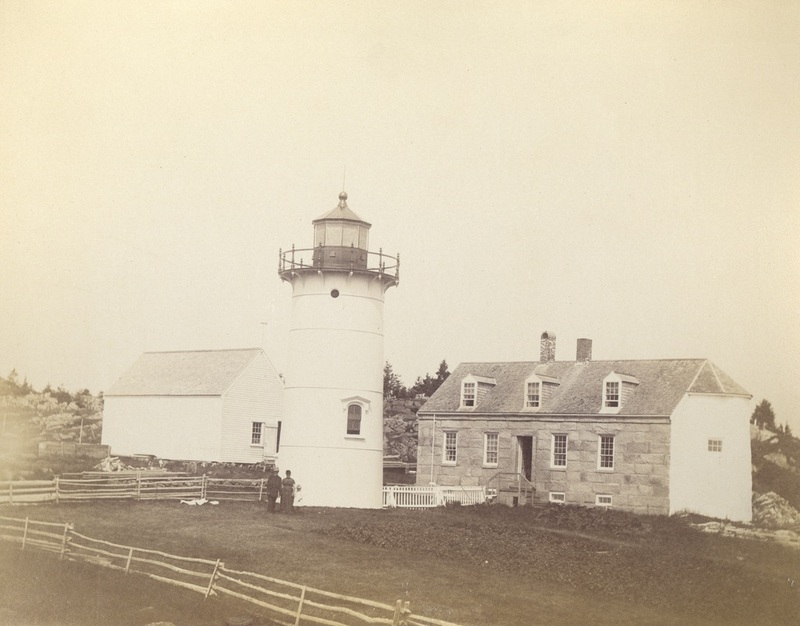 The original lamps and reflectors were replaced by a fifth-order Fresnel lens in 1855. In 1876, the lighthouse was rebuilt. The 41-foot cast-iron tower, lined with brick, still stands. 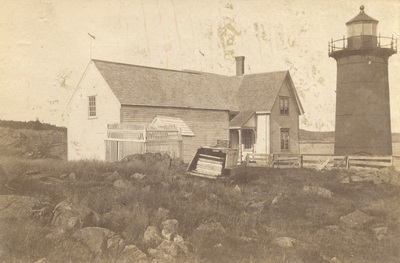 The old dwelling remained standing, but the top part of the old attached tower was removed. 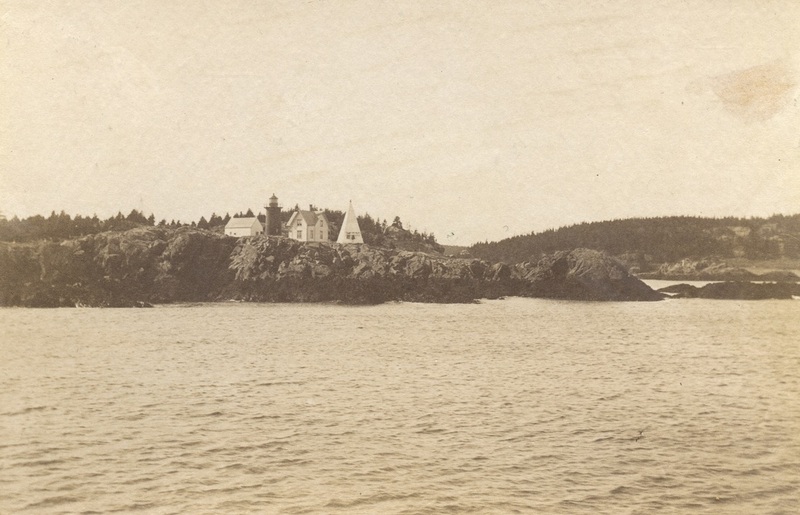 The color of the 1876 tower was changed from brown to white in May 1900. The present Victorian wood-frame house was built in 1888 and the original dwelling was removed. Little River Island is a short distance from the mainland, which made the light a much sought-after assignment for keepers. Willie Corbett was keeper from 1921 to 1939. 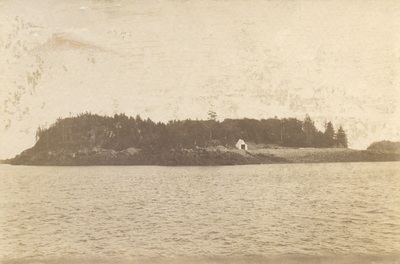 The Corbetts kept a cow, pigs and chickens on the island, a common practice at family lighthouse stations. Keeper Corbett was an excellent fiddler and sometimes left the island on Saturday nights to play at dances at the lifesaving station at Cross Island down the coast. The keeper's son Neil Corbett helped wind the clockwork mechanisms that turned the light and sounded the fog bell. Both mechanisms required winding every few hours. One July there were 525 hours of fog -- "Golly, that was a lot of work!" Neil Corbett later told Christopher Little, author of The Rockbound Coast. Neil Corbett's sister, Ruth Farris, was a popular resident of Cutler who wrote a column for many years for the Machias Valley News Observer. She was affectionately known as "Mother Nature." "We always had a good time," Ruth said to Yankee magazine about her childhood on Little River Island. Ruth Farris died in 1997 and a tablet in her memory stands near an old fog bell on Cutler's main street. 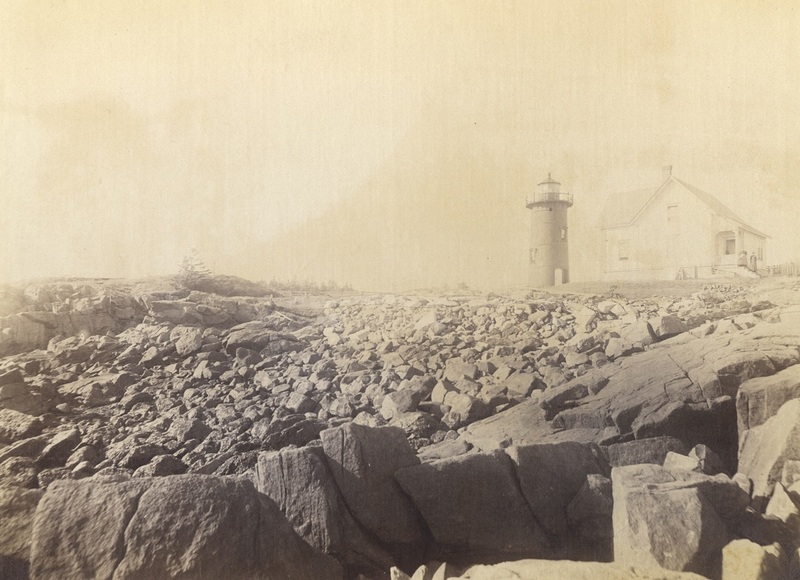 Below: A gallery of late 1800s photos of Little River Light Station from the National Archives. Willie Corbett was the keeper at Little River Light 1921-39. He’s seen here with his wife, Velma, and their children. Courtesy of the Maine Lighthouse Museum. The vessel Sunbeam visited lighthouses and other locations along the coast on behalf of the Maine Seacoast Mission, bringing literature and supplies to people in remote places. When the Sunbeam had passed Machias Bay and Little Machias Bay and saluted Little River Light at the entrance to almost the last harbor of refuge on the southern seacoast of Maine, a young girl ran down the boardwalk to the white wooden pyramid on which the fog bell hung -- three blasts of the whistle followed by three strokes of the bell, then one blast of the whistle and one stroke of the bell. Mr. Corbett, the keeper, came down onto the shingle in his rubber boots and waded into the water to catch the bow of the skiff. Then when we had landed we all dragged the boat high up on the beach . . . Here we were greeted by Mrs. Corbett and the girl who had rung the bell. The girl was the youngest of eight children and the only one left at home. She told me that the large, yellow, long-haired cat, Teaser, had caught all the rabbits on the island. 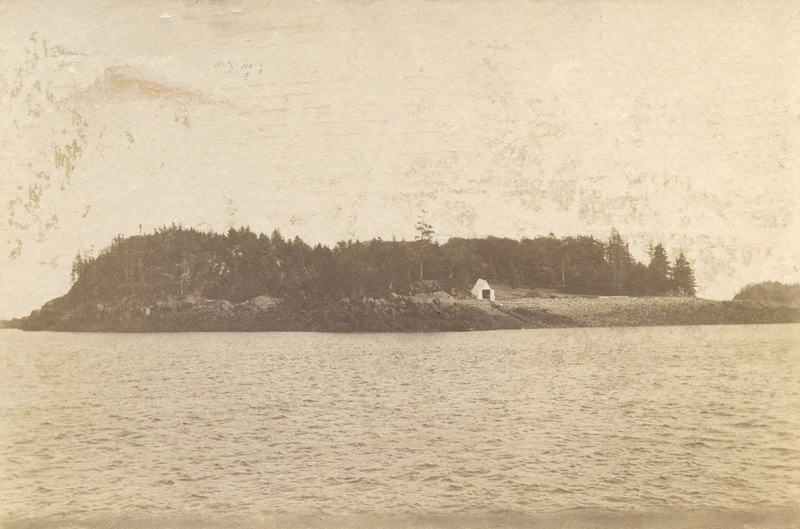 The Corbetts, who had been at Little River for 17 years, once kept a cow on the island, but the animal was no good after it drank three gallons of kerosene. When I asked Mr. Corbett what kind of winter it had been at Little River, he said it had been a good one. Only one day at zero, and no bad storms. It was five or six degrees warmer at the light than up town in Cutler, he said. He took me up in the light tower, from which I could see Grand Manan at the entrance to the Bay of Fundy . . . On the southwestern headland, fourteen miles from Little River, is a lighthouse, and beyond it, out in the water, there is another light on the notorious Gannet Rock. Both lights are visible from Little River. 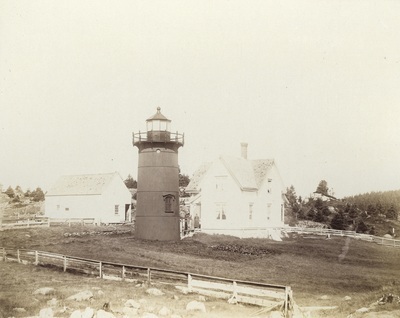 The 1876 lighthouse tower with the old keeper's house. 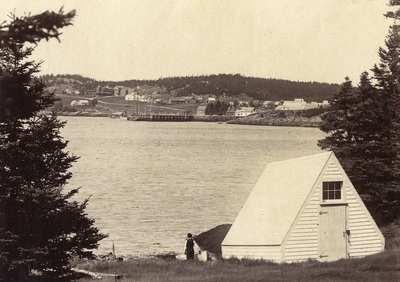 The truncated 1847 tower can be seen at the right end of the keeper's house. U.S. Coast Guard photo. Neil Corbett, son of Keeper Willie Corbett, in 2001. A World War II veteran and inductee in the Maine Baseball Hall of Fame, he died in January 2008. In January 1948, the Coast Guard keeper told the Maine Coast Fisherman that a "big, red fox walked up to our front door this fall, no doubt searching for our two newly acquired kittens..." He also reported, "At this writing we have twelve inches of snow and about every day the wind blows a gale." Glendon Jones served as a Coast Guard keeper from March 1952 to June 1954. When he arrived, the Coast Guard's officer in charge was Harvey Lamson, a veteran lightkeeper. Lamson also maintained a home nearby in Jonesport. The two men each spent 21 days on the station followed by 7 days off, meaning that each of them ended up being alone for about a week each month. 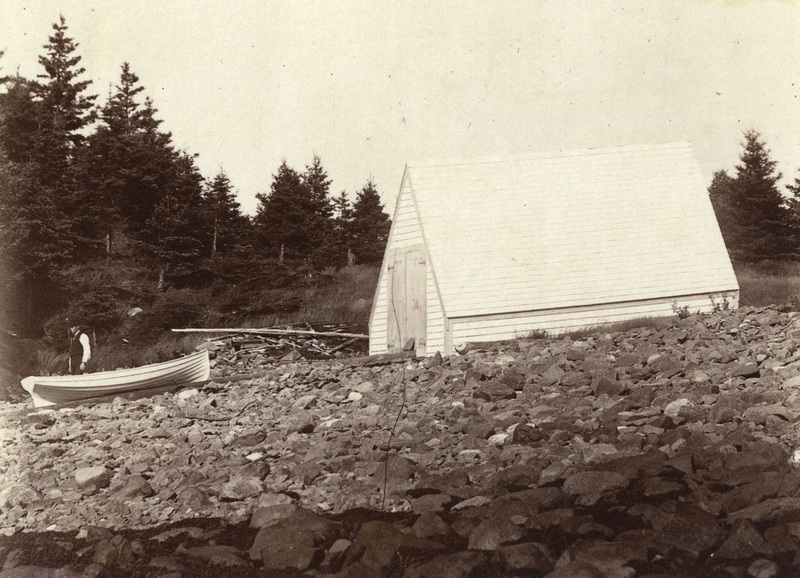 Eventually, the Coast Guard started sending men from the West Quoddy Lifeboat Station to augment the light station crew. There was no electricity on the island, meaning the light still ran on kerosene and the fog bell mechanism had to be wound by hand. Jones recalls one foggy stretch when he started the bell in thick fog on a Saturday morning at 7:15 a.m. The mechanism was wound every two hours until the fog finally subsided a week later and the bell was stopped at 7:00 a.m. on the following Saturday morning. All in all, Jones enjoyed his time on the island. "I loved it," he said in a phone interview in September 2013. "The people in town were fantastic." Cutler became an important coastal defense site in 1960. Two 1,000-foot communications towers were erected at the town's naval base. The towers are used by the Navy to communicate with the fleet in the North Atlantic, Europe and the Arctic. 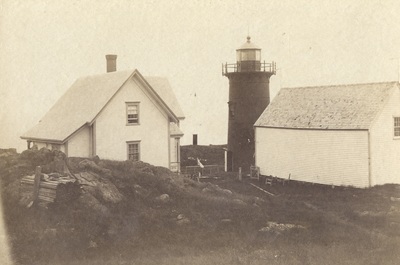 Little River Light eventually was a three-man station under the Coast Guard until July 23, 1973, when orders were given to change the station to a one-man family station due to a shortage of Coast Guardsmen needed for other projects. My wife and I like it out here. We were hoping to spend another year out here, but I guess we won't now. . . We get three days off a month. That's when we go into Cutler for supplies and such. 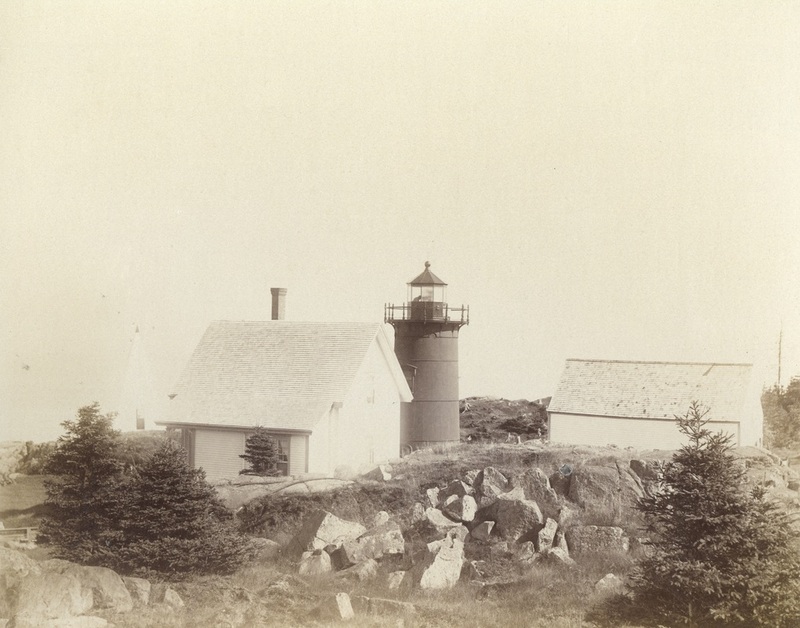 In 1975, the Fresnel lens was removed and the lighthouse was replaced by an automatic light on a nearby skeleton tower. In 1981, a rotating DCB-10 aerobeacon was replaced by a flashing 300 mm optic. When the 9.9 horsepower motor failed, we used the peapod [dory] with two rowing stations for several weeks. One memorable row into work was at low tide with strong northeast winds in October. We climbed into the peapod, shoved off at the top of the rails by the boathouse, slid down the rails and splashed into the harbor. No sooner did we get away from the lee of the island, when the winds and steep waves caused us to both row vigorously on one side of the boat to keep it from rounding up. With our effort we attained a fast clip of speed for a rowing boat and had the delight of surfing down the face of the waves on our way in. Another memory is being on the island for the winter storm of February 1978, which took out the pier at Old Orchard Beach. With a hand held wind speed indicator, I clocked 80 mph wind just outside of the rear, protected door to the house. Once I stepped outside, I was literally blown around and almost down after crouching in anticipation of the winds. Machias Seal Island clocked 110 mph. The property deteriorated over the years, although some concerned residents of the area did some painting and repairs. In 1998, a nonprofit preservation group called Maine Preservation added Little River Light Station to its list as one of the most endangered historic properties in Maine. The property was licensed in early 2000 to the American Lighthouse Foundation (ALF). 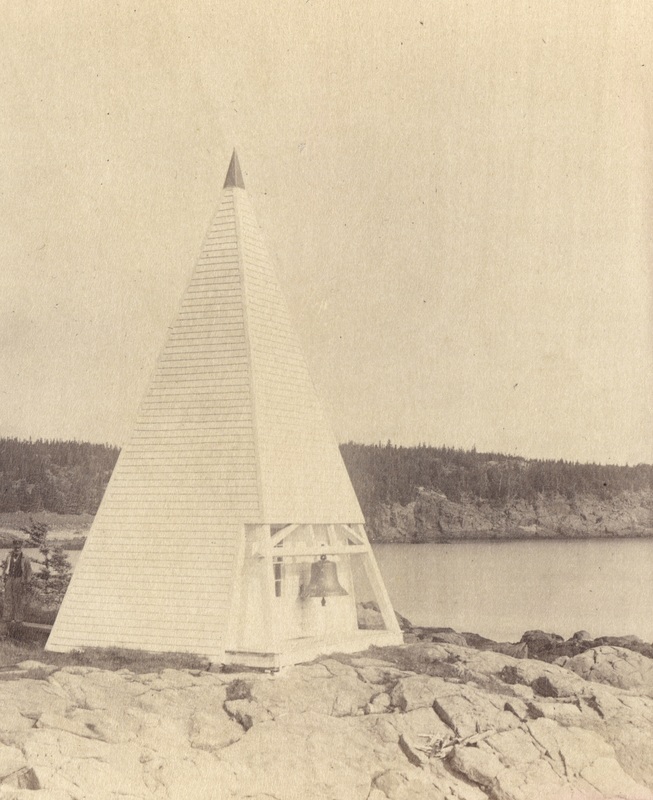 During the summer of 2000, the wooden walkway from the boathouse to the lighthouse was completely rebuilt by the Coast Guard, with financial help from ALF. On October 2, 2001, the lighthouse was officially relighted after being dark for 21 years. ALF volunteers draped a 25-foot flag from the lighthouse. A small armada of boats (about 35) including two tour boats and a large Coast Guard boat took people out in the water to witness the official relighting. The armada then proceeded back to land for a ceremony in the town circle. According to locals and the owner of the town newspaper, it was the largest gathering in the town's history. The Coast Guard presented ALF with a special award for its restoration at the Little River Light Station. Ownership of the light station was eventually transferred to the American Lighthouse Foundation. A transfer ceremony was held in Cutler on July 27, 2002. 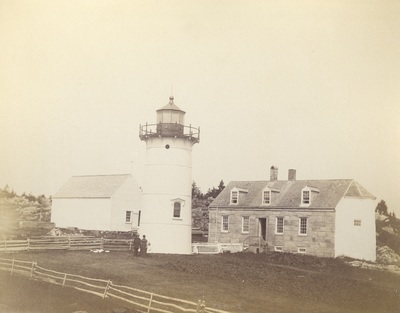 It was the first lighthouse in New England to be transferred under the National Historic Lighthouse Preservation Act of 2000. Since then, much restoration of the keeper's house and tower has taken place. 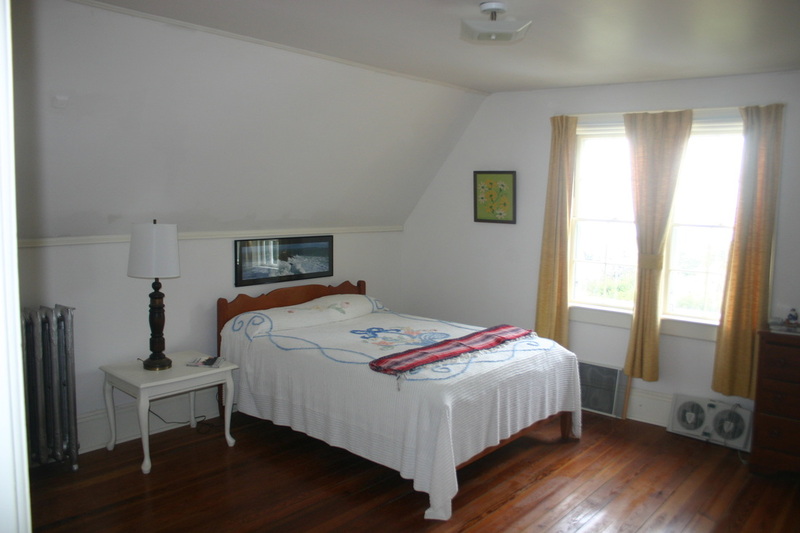 The keeper's house is now open for overnight stays. Click here for details. 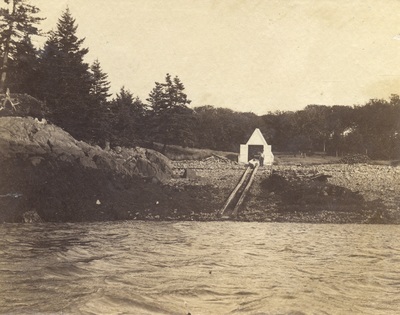 An oil house and boathouse still remain at the station along with the tower and keeper's house. 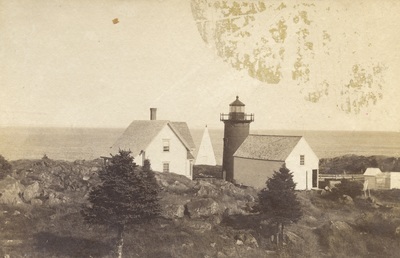 Little River Light can be viewed from Capt. Andrew Patterson's excellent nature cruises out of Cutler. It cannot be seen from the mainland. Left, the stairs inside the tower. Above, a room inside the restored keeper's house. 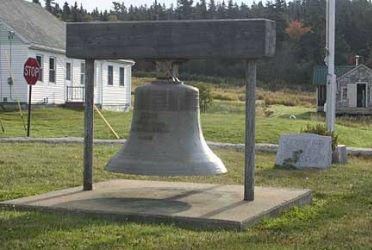 A fog bell from Little River Light is on display in Cutler.